You might consider this Part II of DI:E…explaining itself to itself. That uttered, let me avoid responding for the moment by asking you this: How does it happen that eyes can hear? I’m not referring to the McGurk Effect (…that requires lips), nor to the guy from Maine who needed surgery to stop hearing his left eyeball roll about in its socket (true story), or the cortical re-wiring that some neuroscientists surgically undertake in order to practice…well, weird science (also, true). What I mean is: how does it happen that when we read, we hear a tone? In the case of DI:E…, apparently a snarky one. I covered some of this a few weeks back in DI:E…11.29.13 (thanks to Stewie from The Family Guy), and, of course, narrative tone is the sine qua non for creative writing undergrads. Still, I find it ever remarkable. Not that a writer must find his or her “voice”, but that our ears can turn outside-in and pick up the textual relay from our reading eyes. 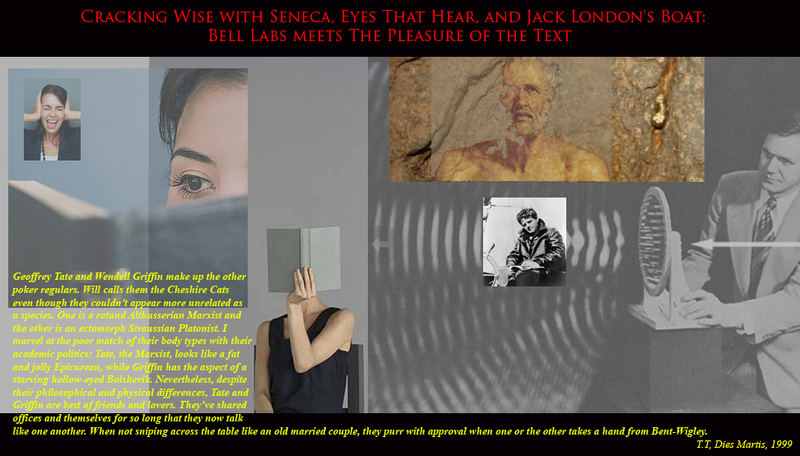 Bell Labs?…meet The Pleasure of the Text. I don’t mean it to be snarky, or irritatingly clever, or whatever the smart-assiness is that you think you’re hearing. Really. In fact, I want you to feel that reading DI:E… is worth the 500 words – give or take – of your weekly time. Even for you slow readers. Nevertheless, one need not be an Althusserian Marxist (like jolly old Geoffrey Tate in AIIOE) to understand the inextricable relationship between Content and Form. You may not have been listening in class when this was covered, but the former tells us what we are talking about, the latter how we are talking about it. And the good dialectical materialist insists they come as a package. The What and How are as entangled as the quantam mechanics in a buckyball. Firstly, to render some difficult ideas less so…and maybe have a little fun with the academic types who made them difficult in the first place. Sure, you can go to the primary sources, or even to The Stone at the NYTimes Opinionator, but you’ll miss the whoopie cushion. Think of DI:E… as me atoning for my own academic sins, while still piquing your curiosity about some of life’s…well, other curiosities. Secondly, to be conversational. I concede that given the number of DI:E…’s followers thus far, it’s probably one-way for the most part – me, myself and I – (the ungainly triad that was first outed in DI:E…01.10.13) but, as I said last week, I’m okay with this. I’ve seen The Shining – not gonna go all Jack Nicholson on myself, or you. That said, O come hear my plaintive cry in the din of the blog wilderness. Then, let’s chat. Think of yourself as a proxy for any one of my three selves. Lastly, I’m looking for a chuckle. Probably no news there. If not a belly laugh, then at least a mild stirring in the midriff. Hell, you can even laugh at me, if you like. One thing we can both be sure of: what the f*** do I know? And, furthermore, what’s with the presumptive gall that I could tell you anything about your own life’s curiosities. You’re the one living in the thick of them. Perhaps you might think of me as that avuncular old wisenheimer who prattles on a bit, but ocassionally, just ocassionally, surprises you with a small nugget that slips through the wise-crack and drops, featherlight, into your day’s lap. …and, if you haven’t already, go look up the name of Jack London’s boat. * Seneca actually had something more drastic in mind. See my colleague Jim Miller’s Examined Lives for an accessible account of Seneca and his lot. Jim can turn a phrase.